When someone hears the words “national park” and “Arizona”, the Grand Canyon immediately comes to mind. Grand Canyon National Park is not the only park in the state. Saguaro National Park is one of twenty-two national parks in the state of Arizona. Named for the famous cactus that is found in abundance within the park, Saguaro National Park has two districts, which are separated by the city of Tucson. The east district is the Rincon Mountain District and the west district is the Tucson Mountain District. Both districts are open from sunrise to sunset. Both districts have visitor centers, which are open daily from 9 to 5, except for Christmas. For most visitors, admission to the park is $10 for a private vehicle and $5 for anyone on foot or on bicycle. The visitor receives a pass which is good for seven days. There are other passes available, such as the Saguaro National Park annual pass, the Interagency Annual Pass, the Senior pass for people age 62 and older, and a free access pass for people with disabilities. Both the senior pass and the free access pass are valid for the lifetime of the pass holder. Check out our Saguaro NP Travel Guide for great info on planning your trip! Before you visit the park, it is best to keep the desert climate in mind. Desert summers can get very hot. Daytime temperatures average about 105 degrees Fahrenheit, with an evening low of 72 degrees. Winters are usually comfortable, with an average daytime high of around 65 degrees Fahrenheit. If you plan to visit in the summer, make sure to wear a hat, use sunscreen, and bring enough water to keep you hydrated. The National Park Service recommends that you bring one gallon of water per person per day. Safety is also very important to keep in mind. The National Park Service’s website lists 14 Safety Guidelines that should be followed when visiting Saguaro National Park. Be aware that there are wild animals such as snakes and mountain lions in the park and that you will be on their turf and not the other way around. Always carry a map or compass with you when you venture out. Hiking, Biking, and camping are all popular activities in any national park. Saguaro National Park offers all three activities in varying degrees. Wilderness hiking is a popular activity at the park. Within the span of 15 miles, a visitor can go from an elevation of 3000 feet to 8000 feet. The park boasts five different trailheads that take you into the Saguaro Wilderness area. There are easy access trails, moderate access trails, and for the seasoned hiker, difficult access trails. Visitors who take the one mile loop hike on the Freeman Homestead Trail will be treated to a history lesson on Arizona homesteaders. The only camping available in the park is back country camping or wilderness camping. There are six campgrounds for the back country camper. If you plan to camp in the wilderness, you must fill out an application for a permit prior to your trip. This application is available in a downloadable brochure on the National Park Service website. If you are not a back country or wilderness camper, there are many campgrounds outside of the park that are able to accommodate RV’s, campers, and tents. The park has several roads and loops for visitors to take a driving or biking tour. Most of these loops have picnic areas and scenic overlooks. In Saguaro East District, there is the Cactus Forest Drive. This is a one way paved road that offers spectacular views of the Saguaro cacti which gave the park its name. The Bajada Loop is an unpaved graded road in the park’s west unit that takes visitors through cacti and offers breathtaking views of the mountains. Be sure and stop at the Signal Hill picnic area and take the quarter mile trail to see the petroglyphs. These drawings were created by the Hohokam over a thousand years ago. Saguaro National Park also offers a variety of guided programs and scheduled events. The guided programs include nature walks where a park ranger or park naturalist educates visitors on the various flora, fauna, geology, and geography of the desert. Another guided program unique to Saguaro National Park is its Desert Seasons Program. Visitors learn more about the five desert seasons that occur in the Sonoran Desert region. Junior Ranger programs are available to children. These programs offer a hands on learning experience for children. Among the activities available to participants are hiking in the desert, cooking trail food on a back pack stove, day camps, and twilight explorations. There are also self-guided Junior Ranger programs. Packs for these self-guided programs are available in the visitor’s center. The primary purpose of the Junior Ranger program is to ensure future stewardship of our country’s national parks through education. There is an online version of the Junior Ranger program available to those who live too far from any national park. For more information, visit Web Rangers. The Annual Fiesta de Saguaro is a celebration held in the park that celebrates the Hispanic heritage of the area. Visitors can experience traditional dances, lectures, music, food, and crafts that are all part of this rich cultural heritage. There is also a children’s area which features crafts and piñata breaking. In 2012, the Fiesta de Saguaro was held the first weekend in March. Another event held in the park is the Saguaro Census. Every ten years, a census is taken of the namesake Saguaro Cacti in the park. Saguaro National Park was established in 1933 for the purpose of protecting the Saguaro Cacti that lay at the base of Rincon Mountain. At the time, there was concern that the Saguaro Cactus was dying out. Monitoring began in 1942 and continues every year. The 2010 census was conducted by over 300 volunteers who worked from October of 2009 to October 2010 taking count of every cacti. 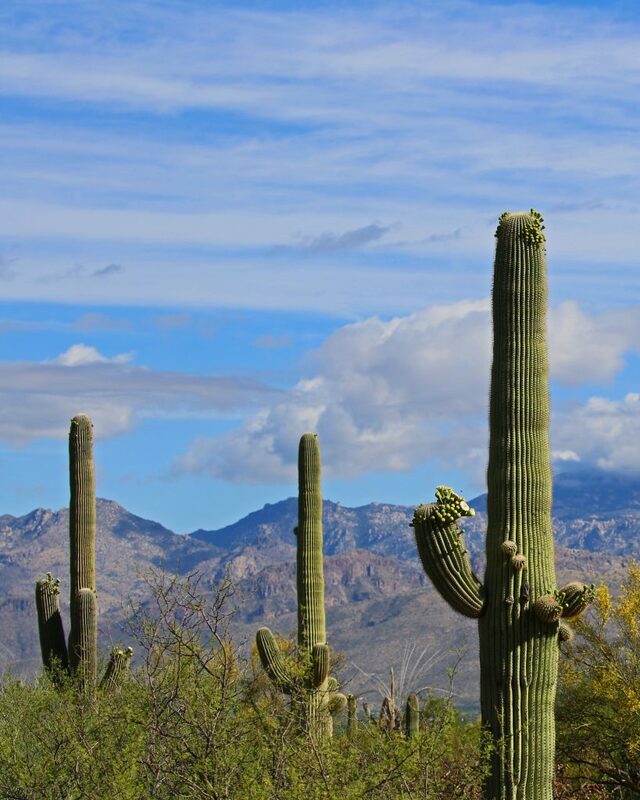 If your travels take you near the Tucson, Arizona area, be sure to stop by Saguaro National Park.